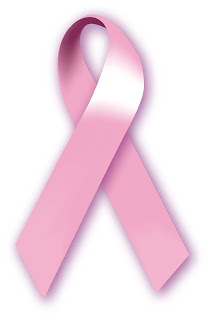 How 'bout calling your bestEST friend and make sure she has made an appointment for a mammogram this year. I asked my best friend and she said," I sure have." Be sure to stop over at BEVERLY'S cottage and see what she is offering to show today...and visit all the other PINKS..
As I am not a PINK person...I don't have very much around my house. 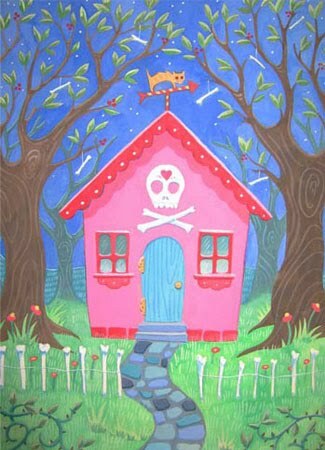 Now..I DO like pink, tho..
even the SKULL and CROSSBONES !! ahhh, and don't we all remember her from WIZARD OF OZ !! Ever seen a PINK sandwich ? Me either !!!! It sure was a lot of fun so if you missed it, go here and join in the fun !!! BJ what a fun blog you have. Thanks for stopping by my place. I just joined as a follower. 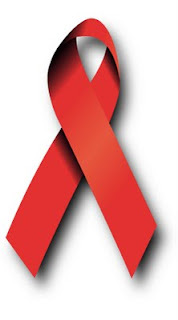 My husband is from West Texas; he comes from a cotton farming family in Slaton. We were just in Lubbock last weekend for Tech's homecoming. It was great....but cold. I love all the pink pictures, especially the pink cat car and pink sandwiches. How fun! Aren't those sandwiches fun? I looked around here to see if I had anything pink to take pictures of...and I realized I don't have pink either. I never really thought about it until blogging! Hello BJ, sorry I have missed a few of your posts. My cousin is keeping me soooo busy. She is going home on Sunday. My sisters are entertaining her the next two days. We are in Fl. for a Gator football game. Fun in the Sun. Your post is so much fun with your pink. The cat car is a hoot and the pink plaid hat is awesome. I would wear that for Halloween. Have a wonderful weekend my sister friend. Happy Pink Saturday! I like that hat. Great "find"! Morning BJ! finally got my pink post up! Pink Halloween... who'd a thought?! BJ would, that's who. I have to say that the plaid pink witches hat is absolutely the best! I want that! You are such a clever thing. I love the pinks you've found to share with us today. I hope you are having a great weekend. Oh my, BJ, you really worked for this one! Oh my Sweet Bj. Happy Sweetest day AND Happy pink Saturday.....Thank you...if you post my little Faithful Frannie AND anyone should want one...I will just take their order and get them one! I do have them at a shop...and one is in a Bridal shop again for a Raffle and the proceeds going to our favorite cause! Again THANK YOU for your continued support of FRANNIE...just direct anyone to my e-mail or bloggie (Now that I have finally posted) We hope to gett one up on e-bay this week...but as you know things have been quitee busy here...BUT there is always time for FAITHFUL FRANNIE....and Hugs for YOU!!!!!!!!!! Oh BJ all your pinkness was so good... Loved that cat mobile! Have a fabulous weekend my friend! Great pink post . I love it. 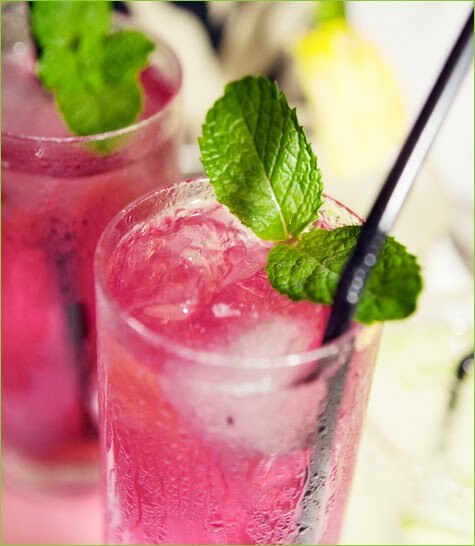 Happy pink Saturday and nice weekend ! I love the pink and green witch hat!! I love pink and green so cheery! Thank you for sharing Happy Pink Saturday! 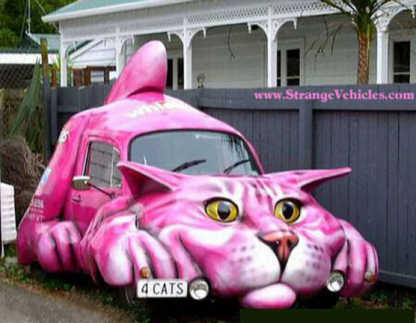 The pink cat car is adorable! I just came over from Nana's blog. Thanks for being concerned about us and letting us know the importance of getting a mammogram. I just had one a few weeks ago.I guess pink really is a good color for October! 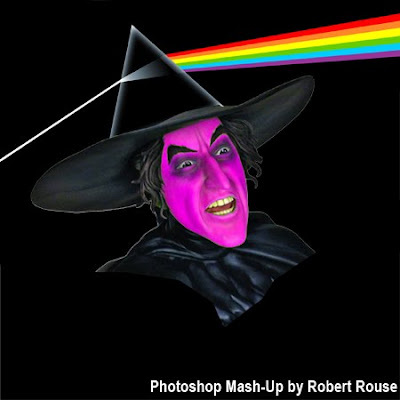 I like the Wicked Witch of the West even better in pink! You managed to come up with a lot of pink! I posted about your sweet gifts to me yesterday. Thank you so much once again! I love all the pinks you found for today...I want that little house! lol Like the others I also love the plaid witches hat, how adorable it is. Fun, fun, fun!!! BJ~ this is certainly a pretty in pink post! I've never seen a pink sandwich either. I'm sure it would be tasty. I think your pink plaid hat adorned with the rosettes is sooo cute. Wouldn't it be fun to have a blog fashion show featuring a variety of witch's hats. Great Pink Saturday pics! 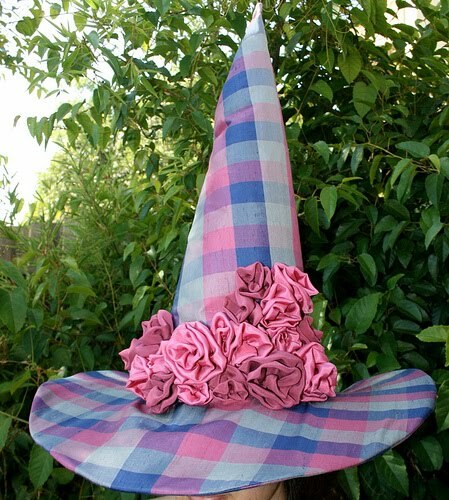 I adore the pink plaid witches hat, and I have a new black one with a spiders! lol Stopping in to say goodbye for a while as I will be off to surgery. haha! what a fun post! Hi BJ; Happy Pink Saturday..
Love the pink plaid witches hat. 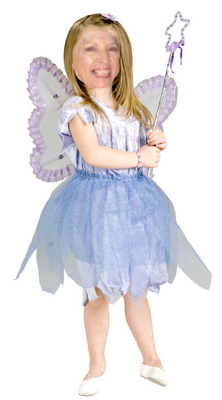 Hey you make a lovely fairy BJ. I love that pink plaid hat! Miss Janice would love it..pink and green are so Lilly! Hi BJ, what fun photos you've got this week. Love that pink witches hat. The cat car is something else! Sorry I'm a little late. Seems like when the sun is out I feel a desperate need to go outside and run errands or just life my face to the heavens and soak in the last rays before winter hits my neck of the woods. It's always so much fun to share in the pink goodness of the blogs gathered together for Pink Saturday. A collection of some of the nicest women and prettiest blogs in cyberspace! Wishing you a weekend filled with l♥ve and sunshine! 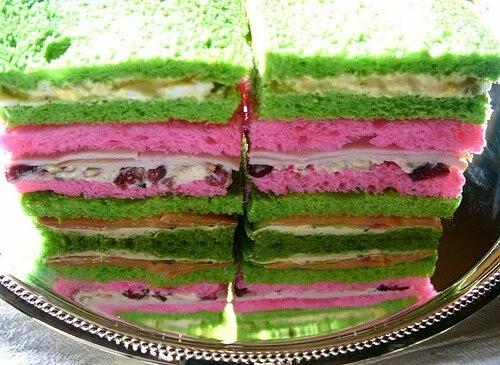 The pink and green sandwich reminds me of a wedding shower I gave a few years ago. Everything was in pink and white. I had the bakery make pink bread for me and did multi-layer finger sandwiches on the order of the picture you showed. You always manage to find the most fun things to show - the pink car is too much . . and a pink sandwich - my goodness how cute can you get? Thank you for showing my giveaway on your blog - you are the best. Such fun pink things you found here. I love your new header picture too. You come up with the neatest pictures for your header! That pink sandwich actually looks pretty good! The hat, I love the hat! I love the pink hat and those cute pink & green sandwiches! For some reason, I was unable to post on the halloween tablescape...I love it, it's darling!